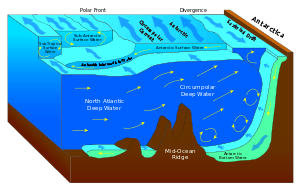 In surface navigation, a cross sea is a sea state with two wave systems traveling at oblique angles. This may occur when water waves from one weather system continue despite a shift in wind. Waves generated by the new wind run at an angle to the old, creating a shifting, dangerous pattern. Two weather systems that are far from each other may create a cross sea when the waves from the systems meet, usually at a place far from either weather system. Until the older waves have dissipated, they create a sea hazard among the most perilous. This sea state is fairly common and a larger percentage of ship accidents were found to have occurred in this state. A cross swell is generated when the wave systems are longer period swell, rather than short period wind generated waves. ↑ "Cross Sea". Glossary of Meteorology. American Meteorological Society. Retrieved 2007-11-28. ↑ "Is the Cross Sea Dangerous?". European Space Agency. 2010. Retrieved 5 June 2016. ↑ Bowditch, Nathaniel (1995). "Glossary C" (PDF). The American Practical Navigator. Bethesda, MD: National Imagery and Mapping Agency. p. 758. ISBN 0-403-09895-5.